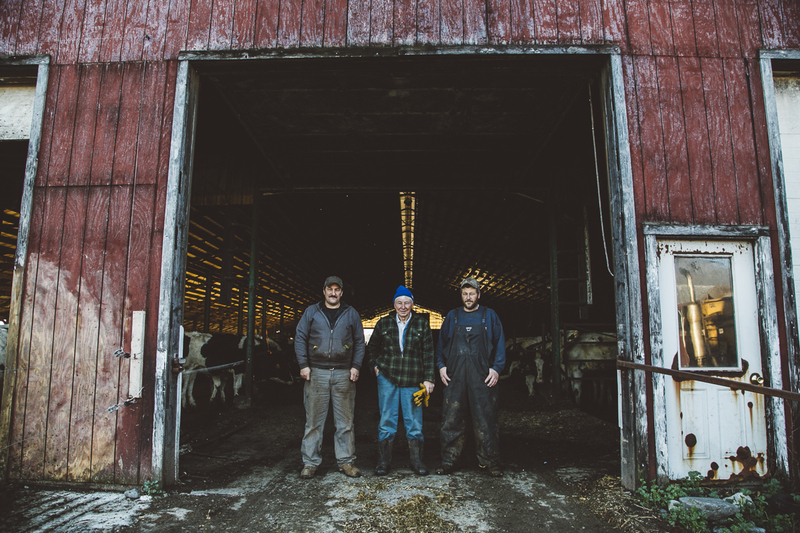 While farming in Maine is growing, Maine’s dairy industry has not seen the same growth. The younger generation choosing to be dairy farmers are few and far between, often deterred by low milk prices and high start-up costs. Those who have bucked the trend and have decided to become either first-generation dairy farmers or to continue their family’s farm, have an important role to play in ensuring that dairy farms remain the foundation of Maine’s farming landscape. Egide Dostie Sr. grew up on a dairy farm, and started his own farm in Skowhegan in 1972. Eventually his sons joined him on the farm : Egide II is a partner in the farm business, and Robert works full-time on the farm, and in 2000 they moved the operation to a larger farm property in Fairfield. They sold milk to Oakhurst until 2013, when low milk prices led them to make the tough decision to sell most of their cows and heifers and switch to raising cattle for beef. This is not an uncommon story. Small dairy farms like Dostie struggle to stay profitable, and across New England many have decided to switch to a different type of farming, or stop farming altogether. But what is less common is that the story of Dostie Farm doesn’t end there. In fact, the family is in the midst of writing a different chapter: this spring, Dostie Farm will start milking cows again, producing organic milk for Stonyfield. When I visited the farm on a cold November morning, the sun was just coming up, but the three Dostie men had already been long at work on skid steers, tractors, and trucks, feeding their steers and heifers. In the barns the heifers were contentedly eating certified organic hay cut from the Dostie’s fields, in preparation for spring milk production. Over the past few years the Dosties have been preparing for the future of the farm in other ways, too. The family has worked with Maine Farmland Trust to protect their farm properties with agricultural conservation easements, ensuring that their land will forever be available for agriculture. The Dosties can use the capital from the sale of the easements to reinvest in their farm, and to help transition the farm from one generation to the next as Egide Sr. retires and his sons carry the business into the future. For an hour or so, I watched and took photos as the Dosties worked in a synchronous and almost wordless flow, which, said Egide Sr., is “what happens when you’ve done this together as long as we have.” As I left the farm, the sun was still climbing, rising over a farm that’s entering a new phase. Every dairy farmer I spoke to this year has said the same thing: in towns where even just 10 or 20 years ago there used to be several dairy farms, now there are one or two…or none. In the Skowhegan and Fairfield area, there are still a handful of active dairy farms, and Dostie Farm will continue to be among them, adapting and re-calibrating to keep farming.